Jim Dabney has been named a 2016 "Intellectual Property Trailblazer" by The National Law Journal. Dabney was one of just 50 attorneys featured in the second annual list that recognizes legal professionals whose achievements and unwavering dedication to the field have influenced the practice of intellectual property law. 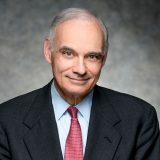 In its profile of Dabney, which appeared in The National Law Journal's May issue, the publication noted that he persuaded the Supreme Court to effect important changes in IP law. The KSR case (2007) greatly opened the range of justifications that can now be argued as grounds for inquiry into what's patentable. The Already v. Nike case (2013) made it more difficult for those who pick patent fights to walk away when things don't go well for them. In the TC Heartland case, Dabney is currently seeking Supreme Court review of 25 years of Federal Circuit case law allowing patent cases to be brought in inconvenient locations. "This argument [in TC Heartland] could have been made in years past," Dabney said, "but IP orthodoxy didn't make it."